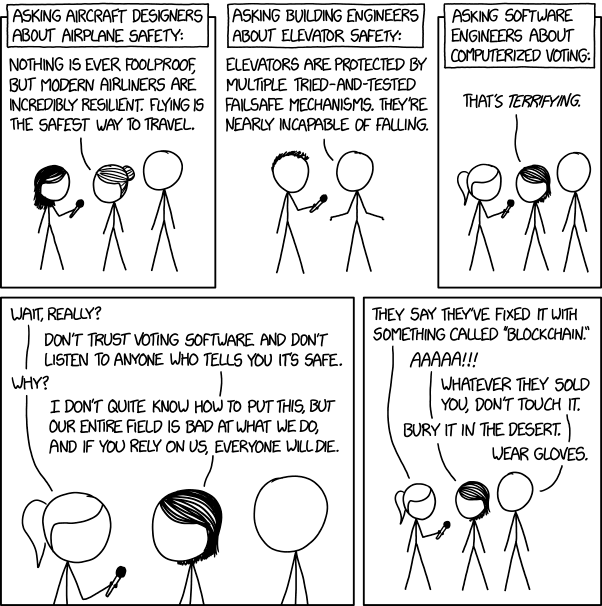 Voting tech can't be hard but then politics shows up and it all goes down the toilet. Lets remove all politics from voting. My much despised previous VP worked for Diebold before coming here. In THAT division. The tortured souls who worked for her could not has produced a reliable product. More than likely they were hoping for a nuclear war to end their suffering. It isn't politics. It is government contracts. Written by people who have no idea how software development works. Who couldn't tell you if it was safe or not. As much as I love technology, paper would be safer. As memory prices came down, well-written software has virtually disappeared and, has been replaced by bloatware. The "That's terrifying" remark reminds me of the stories that I heard when I worked for a mini-computer manufacturer in the late 1970's. The story was that Disney was using our products to control the rides in their theme parks. And knowing that, would you want to risk your life on one of those rides. And look what that 50 cent O ring got us!